Now, one time, the Fianna had stirred up a rebellion among the people of Ireland, and they were at odds with the High King himself, in Tara. He had no intention of starting a fight with the Fianna, so he asked Finn Mac Cumhaill to come peacefully as his hostage until the trouble had blown over, and Finn had agreed. Caoilte was not there when this bargain was made. When he heard that his leader and friend was being held hostage, he was furious, and set out to avenge Finn. He went on a rampage of destruction, going in through every door that the red east wind blew on and destroying all before him, setting fire to the fields, and giving one man’s wife to another. At last he came to Tara, and to get himself inside quietly, he took the clothes off the doorkeeper. He snuck into the king’s hall, and took the king’s sword right out of his sheath, replacing it with his own, which was thin as a blade of grass after all the fighting he’d done with it. Still disguised as a servant, he stood behind the king at the feast, holding a candle. The king was at ease after that, till Caoilte handed him a glass of wine. “There’s a smell of Caoilte’s skin off that wine,” the king said. And at that, Caoilte knew he was discovered, and spoke out. 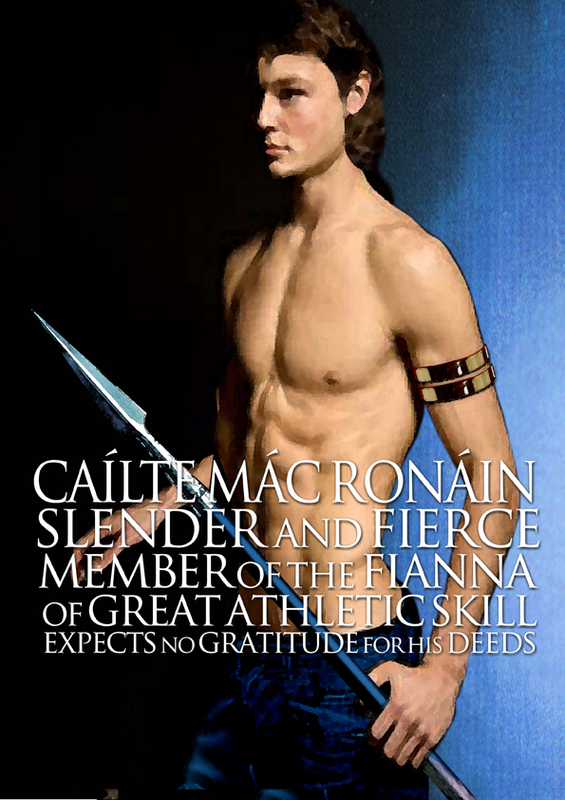 “Tell me what to do to get freedom for Finn Mac Cumhaill,” he said. The high king thought about this. It wasn’t that he wanted Finn Mac Cumhaill as a hostage. If nothing else, this business of looking over his shoulder in case there was an enraged man of the Fianna coming for him was playing havoc with his nerves. It was time he wanted, for the rebellion to die down, and so he decided to set Caoilte a task that would surely take even him some time to achieve. “Right,” said Caoilte, and away he went. He searched through all of Ireland, hunting down birds and beasts, wild and tame. The creatures were all startled, but Caoilte herded them and drove them on before them so fast that they hadn’t the time to fight amongst themselves. All the same, the deer did not like being so close to the wolves, nor the backbirds to the foxes, so it was a terrible time he had to bring them all together in one place and drive them. He almost had it, when a raven broke south, and a wild duck north, and he had to run them both down and bring them back by their necks before anything else could escape. At last, he brought them all before the gates of Tara as evening was closing in, and shouted up at the walls for them to send out the king. The king thought to himself, “This is far too soon,” so he had his men tell Caoilte to wait until morning: he wanted to see all the animals together in daylight. He had them direct Caoilte to a particular house to keep the creatures in all night. It was a house with nine doors. No sooner had Caoilte driven all the animals and birds inside, then they let out a dreadful screech, and every one of them did all they could to escape. There was no rest for Caoilte that night; he had to run from door to door all around the house, flinging back birds and beasts all desperately trying to get away from him and each other. At last, when the sun rose, Caoilte brought all the creatures before the High King of Tara, and such a noise they were still making, that the people called them Caoilte’s Rabble! As he looked out over the creatures, the High King thought to himself that this hadn’t been a bad plan at all. He had bought another bit of time with Finn Mac Cumhaill as his hostage, and after all, this was a fairly magnificent gift. What king in the world wouldn’t want a gathering of all the wild creatures in his land brought to him as tribute? So he let Finn Mac Cumhaill go. And the second Caoilte stopped herding and circling the animals, they bolted off in all directions, fleeing from Tara, no two by the same road, so all the profit the High King had of them was that one glance.